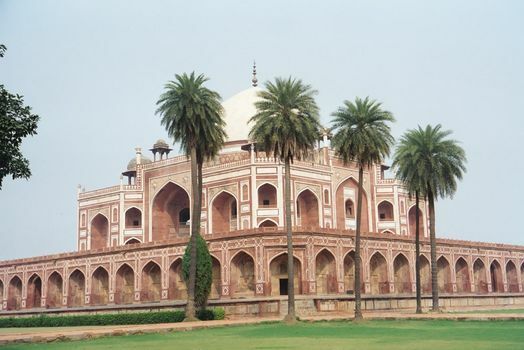 Humayun was the second Mughal (or Mogul) emperor. The son of Babur and father of Akbar, he died in 1556. His chief widow, a Persian from Khurasan, then commissioned the Persian Mirak Mirza Ghiyath to build an appropriate tomb. Mirak imported his design from Herat, Afghanistan--specifically, he copied the hasht behisht, or "eight paradises," pavilion of the Terab Khana Palace there. 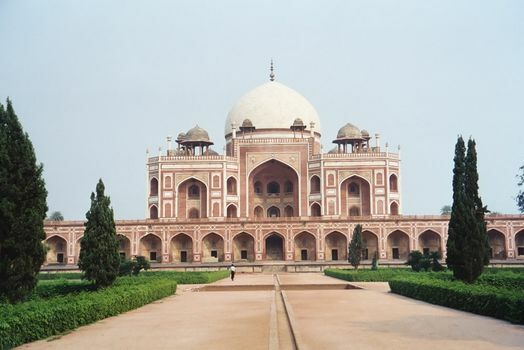 The style would culminate in India in the Taj Mahal, built by Humayan's great-grandson, Shah Jahan. The grounds of Humayun's tomb are laid out in a char bagh design, with water channels dividing the 13-acre site into a garden of 36 identical squares, of which the tomb on its square terrace occupies the central four. The tomb chamber is octagonal under its double-shelled dome--India's first--which vaults an inner chamber 48 feet in diameter. Around the periphery of that inner chamber are four octagonal towers, between which are four porches with iwans, or high arches. Members of the royal family lie in these subsidiary octagons. Although the ceremonial space is entered by climbing to the terrace and entering through the south iwan, here on the right, the actual burial chamber is entered at a lower level--through a door into the south side of the terrace. The southern iwan is shallow to create a high entrance hall behind it. As in the Jami Masjid, the structure incorporates red sandstone and white marble. Here, a chamfered corner. Bright sun is excluded from the tomb by windows screened by jalis, carved-stone lattices. 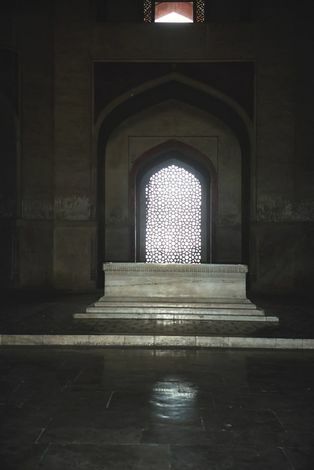 Humayun's cenotaph: white marble, without inscription. Behind it, jalis tracery. Above, there is a domed roof, but it's much lower than the one seen from outside the building. As in the Taj Mahal, the two domes are separated by a void filling almost all of the space enclosed by the exterior dome. 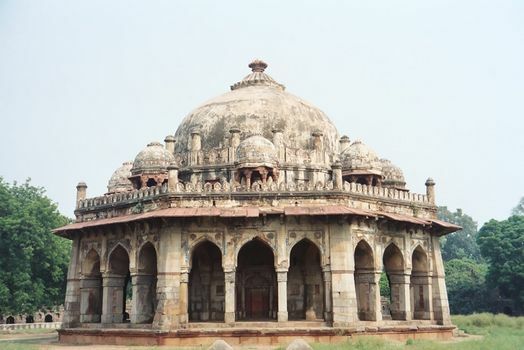 Nearby, the octagonal tomb of Isa Khan, who died in 1547, about a decade before Humayun. 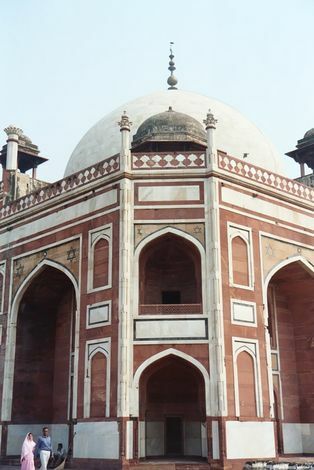 The tomb is unusual in its fusion of Islamic forms with Hindu details, such as projecting eaves and chattris, or domed kiosks. 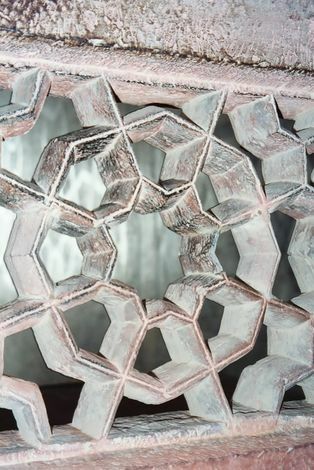 It's a design that can be traced back to the 1340s and the Delhi tomb of the Sayyid Sultan Mohammad Shah.